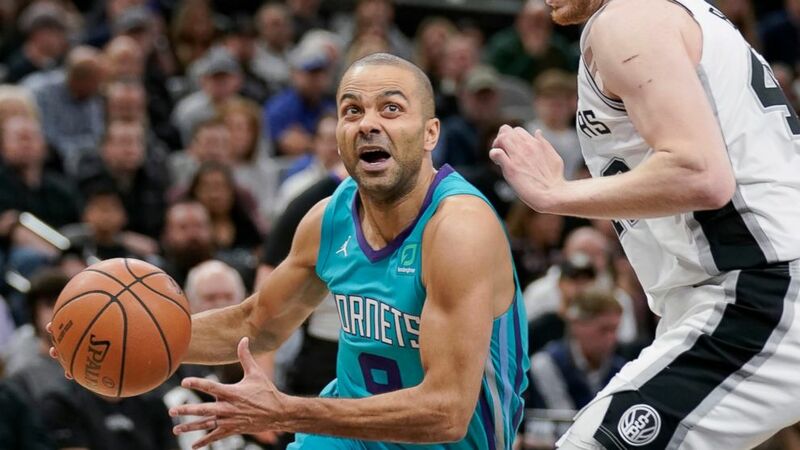 Kemba Walker scored 33 points and Tony Parker enjoyed a triumphant return to San Antonio as the Charlotte Hornets beat the Spurs 108-93 on Monday night, snapping their seven-game home winning streak. Parker had eight points, four assists and three rebounds in his first game back in San Antonio after signing with the Hornets during the offseason. LaMarcus Aldridge led the Spurs with 28 points and 10 rebounds, but they could not muster enough energy on this night as Parker made his emotional return. The cheers continued when Parker entered for the first time with 4:50 remaining in the first quarter. Just as he did for 17 seasons with the Spurs, the slippery point guard juked past defenders and drove the paint probing for layups or open teammates. His driving layup put the Hornets up 82-79 with 8:15 remaining. Parker exited shortly after that and did not return until fans demanded his return by chanting his name again with 17.6 seconds left. Charlotte coach James Borrego, a former Spurs assistant, granted their wish and had Parker enter amid loud cheers that continued until he came out. Parker had a long embrace with San Antonio coach Gregg Popovich following the game as fans cheered his return. The jubilation came despite a rough night for the hometown team. Derrick White finished with 18 points, and DeMar DeRozan and Davis Bertans each had 14 for the Spurs. Hornets: The team’s previous win in San Antonio came on Nov. 15, 2006. . Parker and Michael Jordan are the only players to compete against the team they won four championships with. Jordan faced Chicago while with Washington and Charlotte, a franchise he now owns. . Borrego received a warm ovation during pregame introductions. He served on Popovich’s staff from 2003-10 and again from 2015-18 before joining the Hornets. Spurs: Gay missed his fifth straight game with a sprained left wrist and 10th overall due to injury or rest. … Belinelli missed his second game of the season after hyperextending his knee during a 122-112 loss at Oklahoma City on Saturday. Belinelli previously sat out with a stiff neck on Dec. 2.